There was a maxim that predicted the existence of the longest living trees even before they were discovered, “adversity breeds longevity.” Using this principle conifer scientists traveled to the harshest mountain peaks and found the Brisltecone Pine alive and over 4,800 years old. It stands to reason then that a country that had spent the whole of it’s existence defending itself from an encroaching sea, would have the longest term perspective on the subject. In 01939 when a series of studies in Holland revealed how their country might suffer from from a large storm in the north Atlantic, the Dutch began planning and building. Only part way through their efforts, a storm in 01953 proved them right, killing over 2,000 people and flooding hundreds of thousands of acres of farmland. Shortly after the flood these efforts would be doubled and put into a new nationalized government “Deltawerken” (Deltaworks) program. The Dutch have since been steadily building dams, barriers, and sacrificial flood areas. 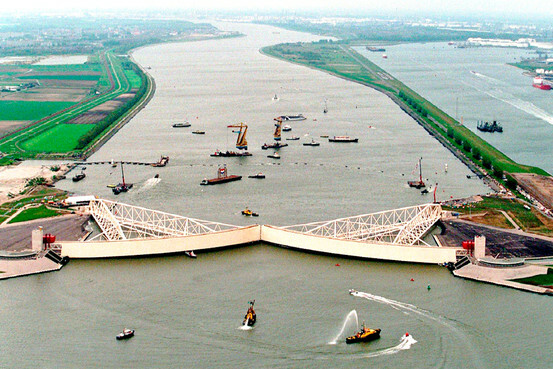 This culminated in the final Deltawerken project completed in 01997, the Maeslant Barrier one of the largest man made moving structures in the world. This barrier opens and closes over one of the busiest ports on the planet, and is strong enough to withstand a once in 10,000 year storm event. Yes, once in 10,000 years. At a cost of nearly $1 billion it seems unthinkable that a country could have this much resolve for such a rare event. In fact the barrier has already been closed multiple times and prevented minor flooding, so it is already paying itself off. In the wake of Hurricane Katrina (considered a 100 year event) which killed over 1,800 people and cost more than $81 billion, it seems unlikely the US will build infrastructure like this to protect the Southeastern seaboard. I am not sure how much more adversity the residents of the gulf coast need however, they have had a tough decade. It could be that the culture in the US looks more to dealing with problems of the future with insurance rather than prevention. 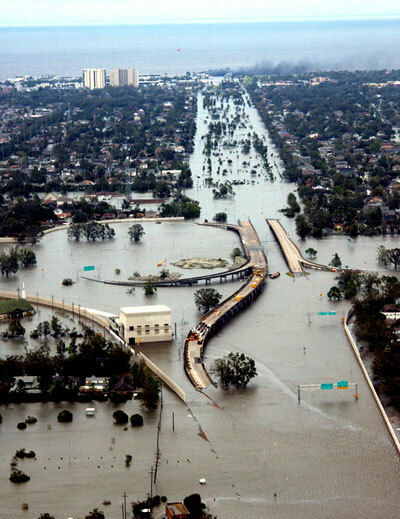 But if I lived in New Orleans, I think I would much rather have better levees and barriers, than a new insurance policy. Devastation of Hurricane Katrina, a once in a 100 year event.